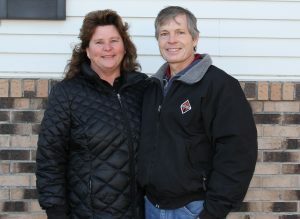 The Minnesota Pork Board recognized Patrick Krzmarzick of Sleepy Eye, Minnesota, as this year’s Environmental Steward of the Year award recipient on February 4, 2019, at the Hilton Minneapolis. Pig farming is progressive. Farmers are constantly searching for ways to improve their operations, increase efficiency, and adopt sustainable practices. Patrick Krzmarzick and his wife, Jacque, not only embrace these changes, but they seek them out and embody environmental stewardship to its core. Patrick grew up on the farm he currently lives on which was homesteaded by his grandfather. For as long as he can remember, Patrick has “always had a passion for farming.” He loves everything about it from living in the country to caring for the pigs. He sees the same passion in his son, Noah, and hopes he will carry on the family tradition and take over the farm someday, following suit with his predecessors. Growing up, Patrick’s father raised summertime feeding pigs outdoors on an open lot. Patrick recalled how the pigs were always facing problems with parasites which created many difficulties. When he was fourteen years old, he received his first group of pigs. After facing challenges with feed inefficiencies, he knew it was time for a change. “The writing was on the wall” when he saw how efficient bob Christensen’s operations were flowing, and he joined forces and began contracting with Christensen farms. “We were able to transition from a rather inefficient production system into a very modern one. Our production increased by approximately twenty-fold with less overall labor and a solid income with a promising future,” Patrick noted. Once the switch with Christensen’s was made, Patrick never looked back. He notes the shift as one of the highlights of his career. Not only did it provide great opportunities for himself and his family, but it created a more environmentally sustainable system that better contained nutrients and reduced runoff issues. Patrick has seen firsthand how these processes evolved over the years and how “every aspect of pig farming has been broken down and managed so precisely. There’s no single part of it that hasn’t been analyzed and worked on to the point where it’s been refined and advanced and efficiencies have been obtained.” These systems and their corresponding data led Patrick to delve deeper into other sustainable projects. In the spring of 2017, Patrick built solar panels on his five-barn site. The panels produce enough energy to power all the barns, plus excess energy that can be sold back to the power company. From Patrick’s point of view, most farmers demonstrate this way of thinking, and readily embrace the task of taking care of the land. It is in their own best interest to protect what they have; if they don’t take care of the land, it will degrade, decreasing its value and affecting their bottom line. All farmers, both in big and seemingly small ways, have adopted more environmentally sustainable methods than what was previously used. As Patrick reviews his farming career, he hopes his legacy reflects his efforts to try and do the right things to protect the soil and keep it in its rightful place on the land. Over his lifetime, he has assembled advanced production systems, and he hopes those systems are viable for the next generation. His ultimate goal is to leave a legacy his son, Noah, can continue to advance.